The Themis Files has been a series that is really out of my comfort zone in a number of ways, but really just worked. This trilogy is written in a series of interviews and journal entries, similar to The Illuminae Files, but based in the nearer future and (mostly) on earth. The first two books of the Themis Files completely blew my mind and I loved every second of them! I was eager to get Only Human, but it actually took me quite a long time to get through it and is a bit different than the first two installments. Like the first two, this book follows Rose Franklin and Vincent Couture. Unlike the first two books, Eva is a main character in this and she's also nearly an adult, as it takes place a decade after Waking Gods. After spending ten years on an alien planet, Vincent, Rose, and Eva land back on earth - Eva against her will. Having been raised primarily off Earth, it's no wonder that Eva did not have much desire to return, but daddy knows best so back she went. I found myself struggling with all the characters in this book more so that in the others. Eva was basically a new character and, while she was definitely a strong female character, which I like, she was also a whiny teenager, which I did not. Her rebellious nature caused issues for everyone and, although I understood her feelings, I found myself becoming very frustrated with her as a character. Similarly, while I understood Vincent's decisions as a parent, there were moments that I would have liked to knock him over the head with something. Still, he remains my favorite character in this series. As always, I love his attitude and snark. Rose was just Rose for me, but I've never been particularly fond of her. 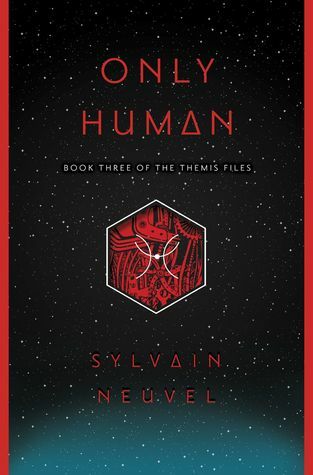 Sadly, my favorite part of the first two books was largely missing from Only Human. The conspiracy aspect is all but gone and instead this book focuses on various countries trying to outmaneuver each other and steal each others' robots. Although there is still some action in this book, it's much more spread out than in previous books. There also wasn't any big twist that I've come to expect from Neuvel. Simply put, it didn't keep me on the edge of my seat like Sleeping Giants and Waking Gods. One thing I did greatly enjoy was the interactions between the main characters and the alien species they lived with! I liked learning more about their government and moral code. I also appreciated the social commentary on racism and the us vs. them mentality. Only Human is a good ending to a fantastic series. It's without question the weakest of the three books and I wish it had packed more of a punch, but at the end of the day I'm happy with it. This series has conspiracy, action, and aliens and I am definitely glad I read it!